I am a guy that does not plan his meals during the week. I think the only time that might occur is on a Sunday, and only then do I think of using what I cook on Sunday as lunch leftovers for the upcoming work week. As example, this past week I had a hankering for something comforting and a bit spicy, so I made a batch of Indian chicken curry with some basmati rice. I’ve eaten that the last couple of days, and it’s delicious. Trust me. But the rest of the week, I poll the family. I always get mixed responses and often have to take a blend of that and come up with something amazing. I joke on the amazing. But in all honesty, I want my wife and kids to come home to a great meal. Who doesn’t want that right? So a recent poll yielded spaghetti and meatballs (everyone agrees on that), and then chimed in my wife, ‘how about rice stuffed meatballs like my mom used to make?’. I have no idea how her mom used to make rice stuffed meatballs, but what I did know is that I can make a mean batch of meatballs and I am no stranger to Italian rice balls known as arancini. So the challenge was on. Start by making your favorite red sauce. If you like the jarred type, go for it. Me, I’m simple. I saute two cloves of minced garlic with one large, minced shallot. Add one can of crushed tomatoes and a pinch of salt and pepper. Bring to a simmer, then towards the end I add in a couple basil leaves. Done. To a large mixing bowl, add the ground chuck, half of the parmesan cheese, garlic paste, bread crumbs, salt, pepper, Italian seasoning, and milk. Get your hands in there and thoroughly mix. Your next step is to form the meatball. My meatballs are fairly large, a bit smaller than a tennis ball, but you can shape them how you would like. The goal is to trap the rice and cheese, as to not expose that surprise. Wet your hands with a bit of water. Take about a quarter cup of the meatball mixture and lay it into the palm of your hand. Take about a tablespoon or more of the rice and place it in the middle. Take pinch of the remaining parmesan cheese, and place on top of the rice. 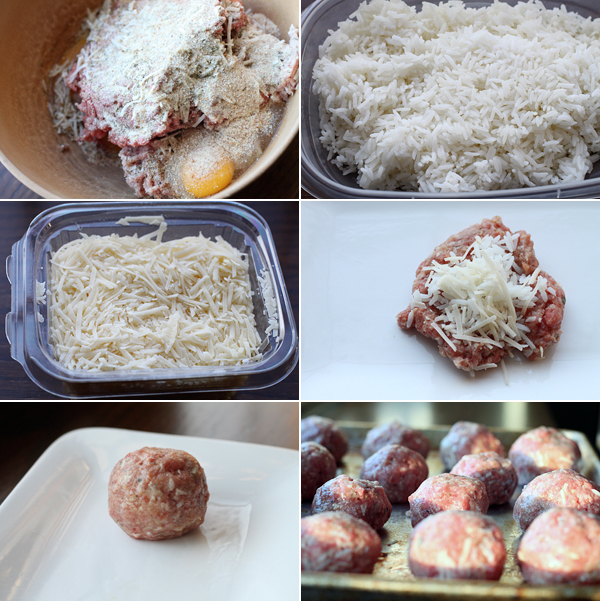 Fold the meat over the rice and cheese, sealing the center, and form into a meatball. Place onto a large baking sheet, and repeat with the remaining meat mixture. Add the baking sheet into the preheated oven, and cook for about 25-30 minutes. Remove the meatballs from the oven and set aside. I like to take the cooked meatballs and give them a good sear when they are finished. To a large skillet, on medium heat, add the olive oil. Add in the meatballs and continue to cook until they are nice and dark on the exterior. 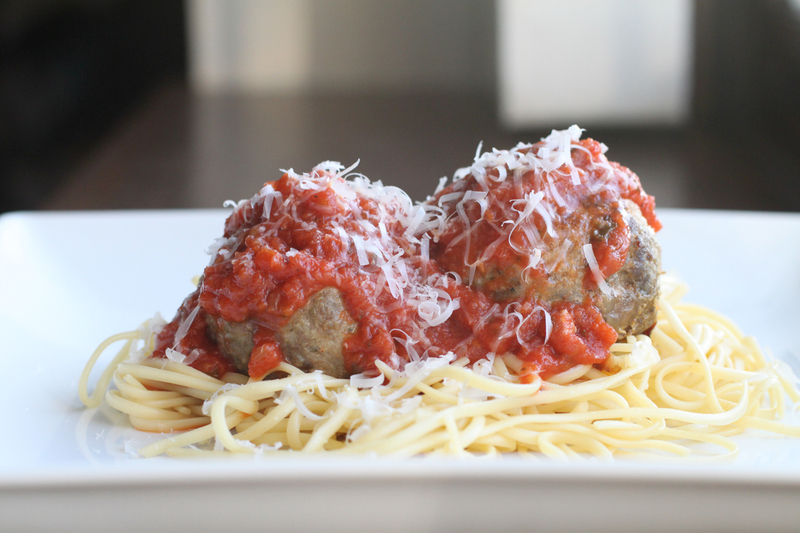 Set aside and repeat with the remaining meatballs. When you are ready to plate, take some of the pasta and add it to the bottom of a plate, or bowl. Add a couple of meatballs, then top with some sauce. Shower with a bit more parmesan cheese, and serve. When I plated these for my wife and kids, they were totally surprised. They had no clue what was inside, and they were amazed. My wife was blown away. She said (sorry mom-in-law) that these were the best ever and nothing like her mom’s and well, much better. So I met the weekday challenge. A super tender meatball, that when cut into yielded a nice pocket of rice and cheese, that when rubbed into the sauce, well, it was just damn good. The next time you are looking to make some meatballs, give this technique a shot. It’s well worth the extra step. Start by making your favorite red sauce. If you like the jarred type, go for it. Me, I'm simple. I saute two cloves of minced garlic with one large, minced shallot. Add one can of crushed tomatoes and a pinch of salt and pepper. Bring to a simmer, then towards the end I add in a couple basil leaves. Done. When I plated these for my wife and kids, they were totally surprised. They had no clue what was inside, and they were amazed. My wife was blown away. She said (sorry mom-in-law) that these were the best ever and nothing like her mom's and well, much better. The next time you are looking to make some meatballs, give this technique a shot. It's well worth the extra step. These look amazing. I could destroy a whole plate!! Thanks Cathy. They were pretty great, and perfect for leftovers. 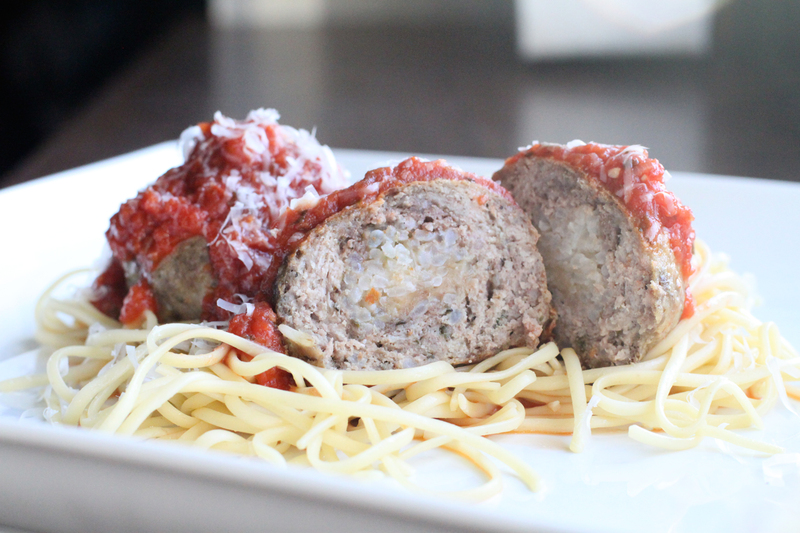 Rice stuffed meatballs? Now that’s a whole meal on it’s own!